Motivated by the loss of his wife to cancer, Partners Mortgage CEO Dan Trinidad formed the first Partners For A Cure team in 2011. We never dreamed what a life changing experience training for an endurance event would be. We also never dreamed that 20 people could raise $100,000 to fund a research grant, but Dan made that possible too. When we became 4th in the nation for fundraising that year, we paused our efforts and started celebrating! Once the euphoria wore off, Dan thought, “Why stop there?” and has been on a mission to raise awareness and funds ever since! Through community outreach and several different fundraising events Partners For a Cure is proud to have raised over $1 Million Dollars for the Leukemia Lymphoma Society. We are equally proud and excited about expanding our fundraising efforts in hopes of reaching those impacted by Breast Cancer as well as Thyroid Cancer. 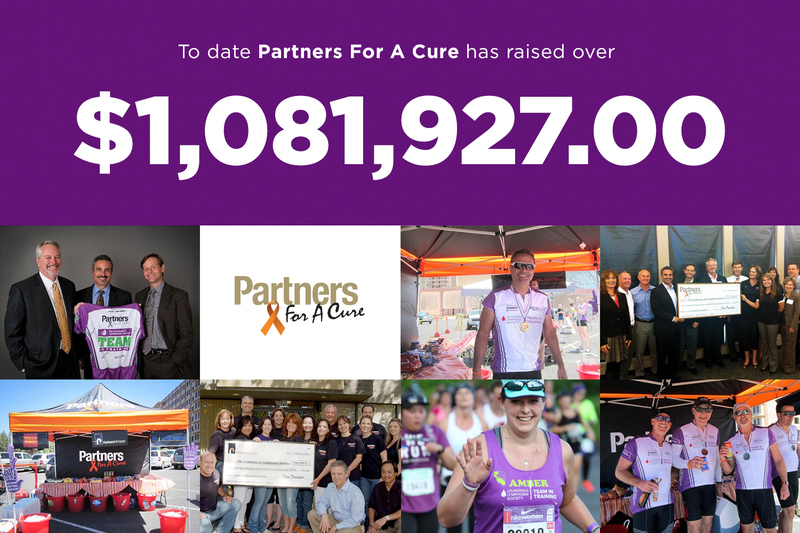 The “Partners For a Cure” mission isn’t about one company, one event, or even one disease. It’s about one cause, one cure, and one day when no more lives are lost to cancer. Become one of the many who are dedicated to this cause. Whether you walk, run, ride, hike, or cheer on those who do, Partners For a Cure welcomes you. New event coming soon. Check back for updates!